While out on patrol in South Africa's Londolozi Game Reserve recently, safari guide Amy Attenborough had what she calls the most "touching and incredible" elephant-viewing experiences she's ever had - which speaks volumes about the bonds of loyalty these animals share with one another. In the dense shrubland of the reserve, Attenborough stopped to watch a herd of elephants passing when she noticed one of the younger members was in distress. A bull calf, estimated to be just a few years old, had become entangled in a poacher's snare which was wrapped tightly around his back leg, digging into his skin. 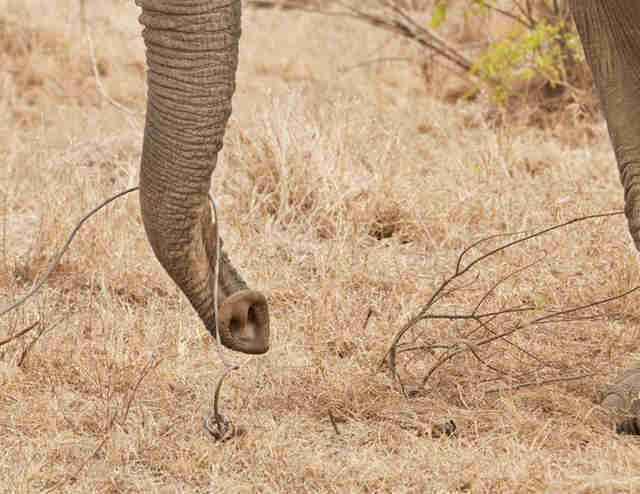 Fortunately, the snare had broken or was untied from its anchor point, allowing the animal to flee the spot where a poacher would likely be returning. 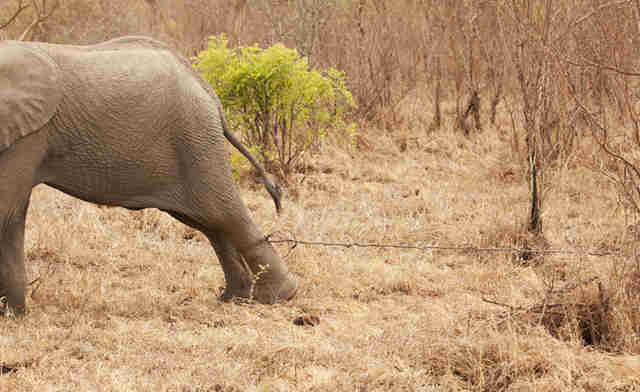 Although he was free, his escape was hampered by the several feet of metal wire which he continued to drag behind him, getting caught in the thick vegetation as he moved away. The calf was not forced to bear this painful burden alone, however. Instead of leaving the young animal behind to fend for himself, the other members of the herd kept the pace of the wounded calf, and even stepped in to help him on his way. "We watched as the wire would snag on trees and the elephant would become trapped, unable to move any further. No sooner would this have happened than another member would arrive, gently lift and release the wire, remove any attached debris and sometimes even carefully carry the wire on its trunk for a while," writes Attenborough. 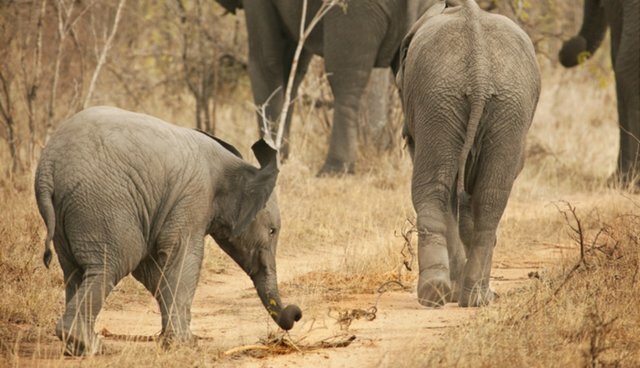 "Even the tiniest elephants in the group knew that something was awry and would sprint next to the wire, desperately trying to pry loose branches that had become entangled in it as it dragged through the bush." Attenborough eventually lost sight of the herd as they crossed the boarder into a neighboring reserve, but she later learned that they found assistance. A veterinarian there darted the calf and cut free the snare from his leg - ending an ordeal that he might not have survived without the help of his herd. Elephants are well-known for forming deep familial bonds, and going to great lengths to keep one another safe from harm - but to see it first-hand is something Attenborough says she won't soon forget. "It was an incredible experience," she told The Dodo in an email. "It just shows how intelligent, gentle and caring these animals are. I feel privileged to have been allowed into their secret world for that one morning."